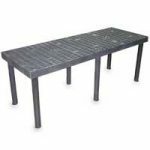 Plant bench furniture for greenhouses, stores, and home… the perfect solution. Holds up to 50% more plant material, durable and long lasting, molded product from high density UV stabilized ABS re-cycled plastic. Introducing Plant Hanger Plus, the first truly effective Greenhouse Plant Benches hanging basket system engineered for all greenhouses providing practicality, organization and convenience. Hang up to 27 baskets from each eight-foot (2.44 m) section. Full integration with a three-step wall plant bench system maximizes versatility and function. 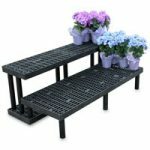 Order today and this will be the last greenhouse plant bench you’ll ever buy! Durable Strong and moisture resistant, Flame Retardant, Good Impact Resistance, Good Dimensional Stability, Easy to assemble, resale value 100%… You cant go wrong with a products such as this! Source and Products for the backyard greenhouse person who needs it right away…. available with casters…. additional cost.. please call! Note: Freight today is exceptionally expensive, in many cases the freight almost equals the cost of one product. Most items are generally in stock for quick turnaround. home horticulturalist in your area who would be interested in quality Plant Bench products that last a lifetime. Freight per item will then be drastically reduced. It cost just as much to ship one item as it does to ship 3 or 4 items. 96″ are common carrier…cost more to ship! Thanks for visiting, Hope we have provided the information your looking for regarding Greenhouse Plant Benches.